I'll start off letting my readers know that Vino Travels welcomed a new member to my family, Lorenzo, born 2 weeks early on November 19th weighing in at 9 pounds 3 ounces and 21 ¼ in length. We're all doing great and taking each day as it comes, but even more reason to jump back into the wine tasting game as we now have a 17 month old running around and a newborn. I'm joining our Wine Pairing Weekend crew as it's been awhile and we're featuring gift giving of holiday wines. If you're a follower of Vino Travels you know I'm a fan of Sicilian wines for their value and unique qualities, especially those wines produced in the Mt. Etna area. 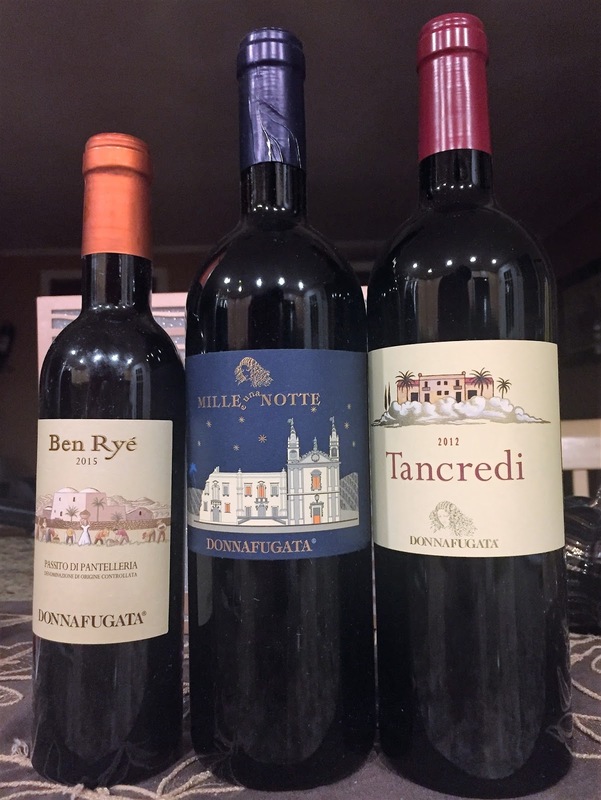 With such a strong presence in the market and quality wines to back up their reputation, today's holiday wine suggestions brings me to those from the winery, Donnafugata. I won't repeat much history on the winery as you can reference my previous articles on them. Overall, the winery began in 1983 by Giacomo and Gabriella Rallo and they produce their wines from 3 sites including Marsala where the family has a cellar since 1851, the island of Pantelleria known for the unique zibibbo grape and Contessa Entellina in southwestern Sicily. Per Folio Wine Partners "the winery was one of the first wineries in Italy to produce all of its electricity from solar energy, taking advantage of the bountiful Sicilian sunshine, and in 2015 the island of Pantelleria was given UNESCO certification recognizing its unique vine training method." Let's dig right in to the wines themselves. Unfortunately due to the circumstances I wasn't able to prepare dishes themselves for each pairing, but recommendations provided. Food pairing: Donnafugata recommends T-bone steak, game and burgers. I'd even recommend pasta alla norma that I've prepared in the past, which is made with eggplant. Food pairing: Donnafugata recommends rack of lamb, pappardelle with pork ragu and other roasts. I think these are the perfect recommendations due to the weight and complexity of the wine. Since the south is rich in vegetables maybe pair the meat with fagiolini alla peperonata, green beans with tomato in a bell pepper sauce. Food pairing: Donnafugata recommends pairing this wine with carmelized duck, foie gras and blue cheeses. I also recommend a Sicilian Cassata, which is a sponge cake originating in Sicily consisting of layers of ricotta and candied fruit and nuts. *These wines shared were received as samples, but opinions are my own. Jade from The Tasting Pour will tell us "How to Choose a Wine Gift"
Jeff from foodwineclick will share "Holiday Wine Gift Ideas: Not Just Any Champagne"
Cindy from Grape Experiences will post "Wines from The Hess Collection – Will You be Naughty or Nice?" Here on Cooking Chat we will write about "Christmas Wine Gifts: Tips and Bottles To Give"
Wendy from A Day in the Life on the Farm will share "Spreading Christmas Cheer"
Michelle from Rockin Red Blog is telling us "How to Give the Gift of Wine"
Gwendolyn from Wine Predator will share "Good Gifts Have Good Stories: 4 Wineries from Napa"
Culinary Adventures with Camilla is talking about "Sips Worth Sharing"
Lauren from The Swirling Dervish is blogging about "Family, Food, and Wine: The Gift of Memories"
Jill from L'Occasion will share "Wine Wrapped Up: The L'occasion Gift Guide"
Be sure to check on Saturday morning for these great articles! We will also hold a live Twitter chat on Saturday, Dec. 9., 11 am Easter Time / 8 a.m. Pacific. Just tune into the #winePW hashtag on Twitter at that time to join the conversation. You can check out past and future #winePW topics by visiting this page.